As the city looks to purchase five new American sweepers to replace the European ones it bought in early 2014 municipal officials have been inquiring as to what went wrong. “Poor maintenance” and “reckless” operation may be the culprit said a representative of the Ravo 5 street sweeper maker Netherlands-based RAVO, Cees Van Der Put, explaining the machine breakdowns experienced by the city’s public works department. City officials have said the machines have been more often in the shop than on the streets. Debris in the cleaning mechanism of the machines jam the compact sweepers rendering the machines inoperable, said city officials. Public works has been struggling to keep the machines on the streets and residents have been complaining about their streets not being cleaned in a timely fashion. Although the city has been having issues with the seven sweepers it purchased for $1.26 from Belleville-based distributor Northeast Sweepers it has not contacted the company with the issues, said Van Der Put. 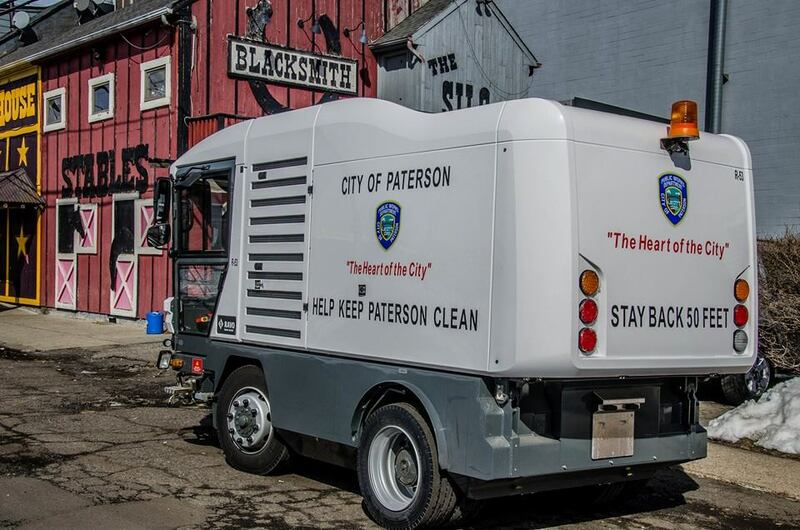 Van Der Put said the manufacturer also has not been contacted about the problems Paterson has been experiencing with its less than two-year old sweepers. Instead mayor Jose “Joey” Torres’ administration is looking to spend $1.15 million to purchase five Tymco Model 600 from its Texas-based manufacturer through a lease-purchase agreement. An incensed council president William McKoy called for a hearing to figure out why the machines have to replace when they were purchased a mere 18 months ago. Van Der Put said this is the first time has heard about the issues the city has been experiencing with the sweepers. McKoy has criticized the hastiness with which former mayor Jeffery Jones’ administration purchased the European sweepers calling it a “poor” decision. Ravo machines have been sweeping the streets of major European capitals like Rome, Berlin, London, Lisbon, Paris, Helsinki, and Moscow – cities that are much larger than the Silk City. The company’s sweepers also clean the streets of Washington D.C. and Montreal in North America, according to its website. RAVO is committed to making sure the city’s residents have working sweepers and clean streets, said Van Der Put. “All other customers we have in the USA but also in Canada or any other country like the RAVO sweepers because of their incredible up time and build quality compared to other sweeping machines,” said Van Der Put. Van Der Put, export sales manager for the sweeper manufacturer, said he will sit the distributor and the city to address the problems the city has been having with its Ravo 5 machines. “We are still committed to make these machines perform as they do everywhere else so the citizens of Paterson will be happy again,” he said. Ojeda said he will have maintenance records and other information at the end of the month for the council’s discussion. “I’m just putting everything together right now for the council, so I don’t want to release anything until I present it to them first,” he said. It’s not apparent whether lack of maintenance or reckless operation have resulted in the constant breakdown, though some residents have noticed the machines, though new, appear unclean and worn out. “Something has gone wrong here and we as RAVO are committed to correct this so the city can spend its money on other urgent issues,” said Van Der Put.